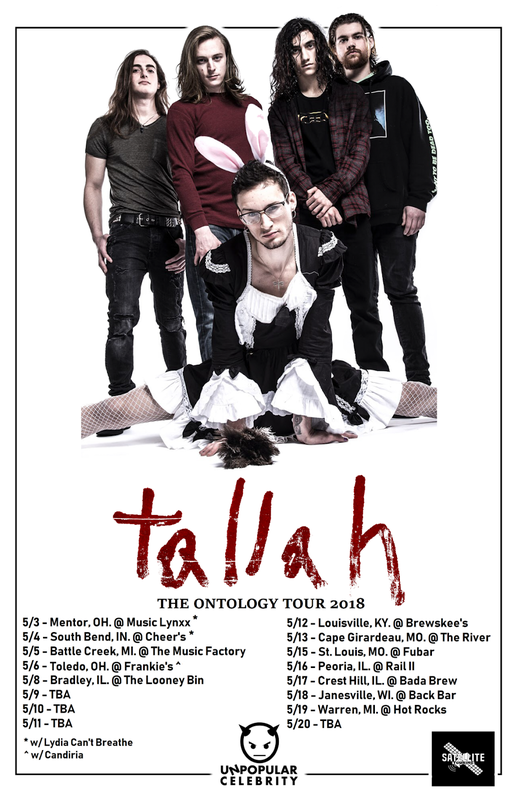 Pennsylvania metal band Tallah announced 'The Ontology Tour' that kicks off on May 3rd in Mentor, OH at Music Lynxx . Tallah is comprised of 5 members who share a passion for playing intense, heavy, and intricate music combined with an insane live show, unlike any other! Influenced by bands such as Code Orange, Slipknot, Korn and Deftones, Tallah relies on the spirit of innovative metal realized through panicked guitar screams treated with industrial elements and distortion. Screaming vocals provided by YouTube sensation Justin Bonitz mixed with melodic choruses create a dreamlike vision in which the audience can live. Driving bass fills the room with deep and dirty tones that sync effortlessly with the thunderous bellows of the drums. The energy they emit onstage challenges you to stay put and thrash about! Justin Bonitz and Max Portnoy are available for interviews! If you would like to attend a show for review or to interview the band, please let me know.